Baronet Sir August Mallory was found deceased in his home in Evermore on the 29th of Frostfall, 586. He was the widower of Lady Annette Richaut-Mallory, and shared over 60 years of marriage with her. 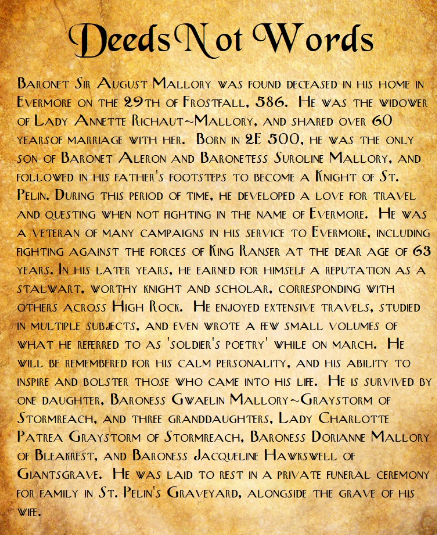 Born in 2E 500, he was the only son of Baronet Aleron and Baronetess Suroline Mallory, and followed in his father's footsteps to become a Knight of St. Pelin. During this period of time, he developed a love for travel and questing when not fighting in the name of Evermore. He was a veteran of many campaigns in his service to Evermore, including fighting against the forces of King Ranser at the dear age of 63 years. In his later years, he earned for himself a reputation as a stalwart, worthy knight and scholar, corresponding with others across High Rock. He enjoyed extensive travels, studied in multiple subjects, and even wrote a few small volumes of what he referred to as 'soldier's poetry' while on march. He will be remembered for his calm personality, and his ability to inspire and bolster those who came into his life. He is survived by one daughter, Baroness Gwaelin Mallory-Graystorm of Stormreach, and three granddaughters, Lady Charlotte Patrea Graystorm of Stormreach, Baroness Dorianne Mallory of Bleakrest, and Baroness Jacqueline Hawkswell of Giantsgrave. He was laid to rest in a private funeral ceremony for family in St. Pelin's Graveyard, alongside the grave of his wife. 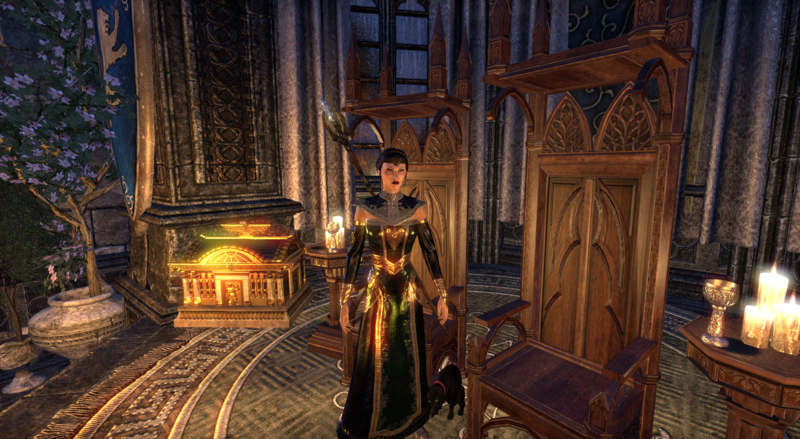 Looking for my ESO Characters? Have a look here. Arthur Skaggs, the highwayman, who stands charged with robbing the constabulary mail, and who was brought up from Murcien's Hamlet to Evermore, did on Loredas last, about 7 at night, escape out of the press-yard in the towne jail. The felon had accomplice, the disreputable Leo 'the Foyste,' who had garishy dressed himself in a woman’s apparel, painted his eye-brows, and by producing counterfeited notes, he did obtain leave to go and bring victuals to the felon Mr. Skaggs in the jail - leaving a bonnie basket also with the jailer. While being conducted down the jail by the duputy, the tawdry foyste assaulted the deputy as the latter opened the door for him - the foyste's lie had been discovered by exceeding in his compliments and curt'sies to the turnkey. The deputy was pulled into the jail by the felons, who locked him up; and afterwards attacked the head keeper, to get the key of the outer door from him. The felons escaped and were not seen again, having returned to the country. There is not a verier foyste at large in all the province. According to scattered reports from across High Rock, a small number of nobles from various minor Houses have suffered bizarre, unexplained bouts of violent and savage madness. Several reports have been collected of Baronets, Knights, Lords and Ladies committing unspeakable crimes: bizarre mutilations, gross murders, and worse. Further reports of torture, arson, and cannibalism have been made, but not verified. One noble, a minor Lord of Wayrest, was apprehended by the King's men whilst attempting to perpetrate unspeakable violence upon his newborn son with a soup spoon, while muttering about a "tearing insanity, tearing like one might tear chicken with teeth". Curiously, the afflicted lord was seen to carry bizarre mutilations and strange growths upon his flesh that he had not had a day or two before. Authorities in courtly circles are investigating, but have found no links between these strange and frightening bouts of madness and the families suffering them, seemingly at random. Caution is strongly advised, and members of the Temple and the Mages' Guild are both allegedly making efforts to unravel this mystery. Hoonding's Beacon has lately been very insular about what is going on after the Baron's denouncement of Magnifico Orrirod at-Lhotuln, but now merchants that were allowed out of Hoonding's Beacon have confirmed that Gallant Zinnamar at-Lhotuln has been captured by Baronetess Atmika at-Morad in the battle deemed, "The Battle of the Sandstorm Pass." The Gallant put up a good fight against the combined forces of House at-Morad and House at-Umari, but he lost to the greater numbers. Now, the rest of the armies of the mountain houses have assembled and are currently laying siege to Talatet. The Baronetess of Qasyat was designated to lead the campaign for breaking the rebellious house's army and allowing the other houses to assemble more easily. There will be no court meetings until the siege is over, but if there is anything of importance that needs to be brought up the Atmika at-Morad, send a letter forward to her siege camp. In the Barony of Northpoint on the northern coast of Rivenspire a grand estate and castle on the cliffs known as Shadevale has sat vacant for the past two years, falling into some disrepair. It was originally sold back to the Dorrells after tragedy struck the Barony of Gawad Du while their cavalcade traveled from the estate to the newly built stronghold of Du Dalghenna. Many died or vanished and the Baroness went into seclusion and has not been seen since. Although several attempts have been made to settle the estate on other noble Houses within Northpoint none have been successful and rumors have spread that the place is haunted and perhaps accursed. However, recently it has been purchased (at a much reduced price) by a Breton noblewoman rumored to be a kinswoman of the ill fated Gawadunens. She has been seen recently in Alcaire's Court to enter negotiations for a master mason to undertake repairs, especially on the family chapel to Dibella. If there are ghosts, perhaps they recognize her bloodline, for she has reported no trouble since she has taken possession of the estate. Still, finding servants and workers among the locals of Northpoint has been difficult, perhaps prompting her search in Stormhaven. Little is known of Lady Melusine Sangnoir but those who have seen her attest that she possesses the dark hair and vivid green eyes her kin are known for. 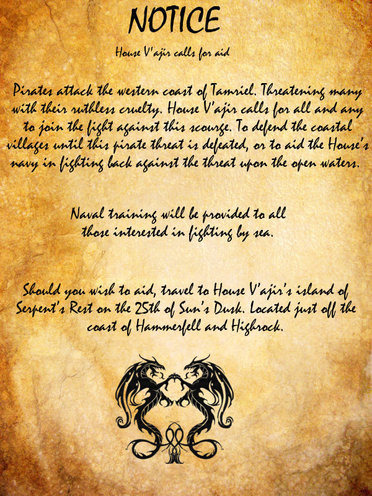 This notice also acts as the RP hook for other to find a way to get their character into the Waters of Kings story. If you are struggling to figure out how to bring your character into the Water's of Kings storyline, this is the perfect opportunity to use. Allowing an easy IC way for characters to help out without feeling like they are forcing their characters into the RP. Questions for this event or the story should be directed to myself. (Discord: Sabriel7#7044). More information on the Waters of Kings storyline can be found here: Waters of Kings Thread. All RPers are welcome to take part. Pirates attack the western coast of Tamriel. Threatening many with their ruthless cruelty. House V’ajir calls for all and any to join the fight against this scourge. To defend the coastal villages until this pirate threat is defeated, or to aid the House’s navy in fighting back against the threat upon the open waters. Naval training will be provided to all those interested in fighting by sea. Should you wish to aid, travel to House V’ajir’s island of Serpent’s Rest on the 25th of Sun’s Dusk. Located just off the coast of Hammerfell and Highrock. Another strange attack in High Rock! This time amongst a pair of feuding families in southern Gauvadon. Baronet Adalard Dupre and Baronet Delvin Charnis have been but the most recent players in a generations-long feud. Recently, the tensions boiled over into a red-hot frenzy and one night of rage and savagery. Knights and guards responding from Wind Keep found the two holdings in a state of devastation, with survivors from both sides bewildered and struggling to put what they saw into words. Reports are jumbled, but survivors from both baronetcies say their respective lords had seemed to withdraw deeper into themselves, and showed a nasty temper in the last days, leading to violence between the two men! Even worse, the violence reached a fever-pitch when Baronet Charnis's form seemed to twist in upon itself even further - showing a hideously-deformed vampiric face! 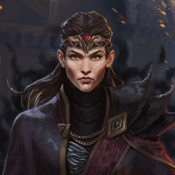 Paladins and Priests of both Arkay and Stendarr have been recruited to investigate further and root out any lingering vampiric or daedric taint. One harried survivor reported the twisted vampire uttering a single phrase before the horrors unfolded: "What has risen may fall. And what has fallen may rise. We hear its call and await our coming doom." 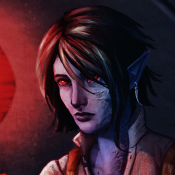 Lord Charles Williams of Rivenspire has long been the subject of rumors. He has survived accusations of necromancy and murder for over a decade, but this time was different. With public outcry growing the Shornhelm guard was authorized to search the Lords estate. When they arrived they found it in flames. The Lord reported an angry mob was responsible and once again turned the narrative on those who were after his reputation. Marquess Rhea Rousseau at-Rabiah and Marquis Sythrin Rousseau were blessed with a baby boy on the 14th of Evening Star. 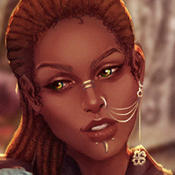 Born healthy, Calem Rousseau was welcomed by not only his mother and father, but the family that he will be raised amongst in House Rousseau at-Rabiah and the people of Ra Kotu. 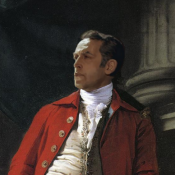 Rumors, said to have been come from a rambling drunkard who called himself 'Cedric' at a local tavern, say that the Marquess was under duress during the birth due to an unknown threat. If such is true, it would seem that through brave efforts of friend and family, the Marquess and newborn heir arrived safely home. Some wonder if the House may offer coin or prize for those who can offer information or assistance related to the menace. Despite the predicament, the Marquess and Marquis are overjoyed, spending time with their newborn Calem and looking forward to introducing him to the people. It is rumored that they may publicly present Calem during the Ra Gada Olympiad. The harsh land of the Ravenwood. A region of dense forest lined on steep crags and harsh canyons. It is known for its hostile wildlife and dark beauty. It also happens to be a favorite place for criminals to hide as the Williams family has a history of not hiring guards to patrol any of the Ravenwood except the main estate. Under the leadership of Baron Charles Williams, whose mother the Baroness passed last year, he has fired all House guards. Such an action only contributed to the rumors he is a murderer, necromancer, cult lord, and other accusations one can dream up. That same decision also led to the mob that assaulted his Estate to actually burn it to the ground. Contrary to the belief of the people of Rivenspire no undead army was raised to halt their faux holy crusade. Now in the aftermath of the events Lord Williams, who uses his title as Baron only when formalities force such, appears to have hired mercenaries. These mercenaries have kill on sight orders for all trespassers. Several of the folks who have pushed the vile rumors over the years have been reported missing by their friends, though Lord Williams claims the mercenaries have reported no deaths or arrests. They have however beaten the living daylights out of a few towns folk caught attempting to enter the wood, but they cut them loose with just a warning.